Saxman Jeff Ryan is excited and for good reason. The contemporary pop instrumentalist’s debut single, “Up and Up,” flew to No.1 on the Billboard chart as well as on three other charts in the US and UK. 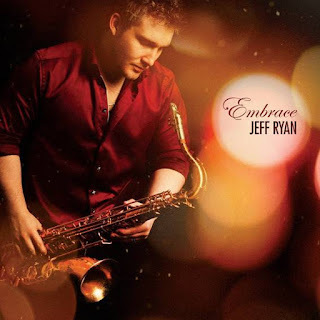 Even before his debut album, “Embrace,” drops Friday (July 13) on Woodward Avenue Records, the buzz surrounding Ryan helped him score the final performance spot in the all-star lineup for the venerable Catalina Island JazzTrax Festival, a confirmation that the Bay Area native is the genre’s breakout new artist at the midyear point. Ryan’s producer and writing partner on “Embrace” is noted keyboardist and chart-topper Greg Manning. One of the saxophonist’s primary goals is connecting through music and performance, and “Up and Up” is an upbeat tune celebrating the winning chemistry and connection he shares with Manning. “‘Up and Up’ is the first song we wrote together. It’s a relevant track that captures our great connection. It was two positive people, and the music flowed naturally and easily,” said Ryan about the single that also vaulted into the No. 1 position on the Mediabase, Smooth Jazz Network and British Smooth Jazz charts. Music has been Ryan’s voice ever since he began playing the sax when he was ten and it’s what he turns to when life gets difficult. It’s his chosen form of communication and connectivity, thus it’s important that his music be honest and relatable.